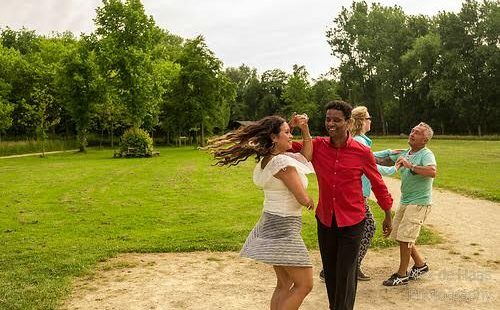 Start Salsa Dancing This Year | Rochester Young Professionals, Inc.
For me, it was my bruised ego that first introduced me to taking salsa dance seriously. Let me explain. Moving to Rochester wasn’t the easiest transition for me. I was overwhelmed with work and had some trouble fitting in and finding friends. That was until I stumbled upon the small but vibrant Latin American dance community here in Rochester. Now, I am hooked. After a work event last summer I was out with some colleagues and they were salsa dancing. I bragged that as a musician I had a good sense of rhythm and thought because my mom was from Latin America that I could pick up the dance easily. I jumped on the floor with them and was thoroughly embarrassed by my inability to quickly learn the dance. With my tail between my legs I decided that night that I would learn how to salsa dance. After doing some research I started taking lessons at Inikori dance studio off University Ave and realized that I loved salsa dancing. My instructor, Katie, then invited me to other events they had and through that I met others who danced at Tango café on Friday, Inikori dance studio on Saturday, Tapas 177 on Thursday and Saturday and about a half dozen other places and times. Some offer regular personal or group classes for a very reasonable price and others offer free group dance lessons on certain nights. Within a 10-mile radius of downtown there are so many places to do salsa dancing and people have formed a thriving Latin American dance community. When you show up at a dance you will see a range of people from the beginners to those who have danced professionally. A mostly Millennial crowd but a mix of ages, races, ethnicities and culture connected by their love for dance and music. After you learn the basic steps you develop your own style and feel and then create with your body how you interact with the world. You can’t help but smile, laugh and feel good out there stepping, swaying and shaking your body to the beat. But also people are friendly and eager to help you even if you are a relative beginner. If you are one of those people like me who start exercising at the beginning of each year with lofty goals in mind but eventually decrease then quit on your exercise schedule, then dancing may be the solution for you too. Some people enjoy lifting weights or running endlessly around a track, but I can’t dredge up a more depressing way to spend my time. If this is you, then you should try salsa dancing. You are much less likely to quit your exercise if you think it’s fun. And if nothing else, salsa dancing is FUN! As a musician, I have performed in bands, choirs, a cappella groups, musicals and operas. And as a singer I’ve enjoyed the solos and spotlight. Unlike singing where you are either in a group and expected to blend in or you have a solo where you can showcase your individual talent, dancing is a completely different beast. When you are out salsa dancing, you have the feeling of doing your own solo as you move with your partner while also sharing the joys of being in a group choir because you have people all around you moving, twirling and stepping to the same beat. To experience salsa dancing is to experience a joy and ecstasy that is hard to explain – your dopamine levels are sure to start peaking. Take on a new challenge this year and learn how to salsa dance. Spend some time getting to know the exciting Latin American dance scene here in Rochester by taking some easy group classes. As we get older it gets harder to find outlets for pure fun where you can develop platonic relationships with strangers and genuinely enjoy yourself with them. See you on the dance floor!